Public Transport in Mae Hong Son and How to Getting Around. If you’re a real tourist, but you don’t have a car, that’s not a big deal. Even you visit a popular province like Mae Hong Son, having no car is in fact not a problem at all. In Mae Hong Son, there are many other ways to travel around, beside driving a personal car. Now, let’s see which ways they are. In case you want to travel from Bangkok to Mae Hong Son, beside of a plane, you can take a bus too. You have to wait for one at Northern Line Transport Station (Mochit 2) at Kamphaengphet Road. These bus departs everyday. Or, if you happen to be in another province of northern Thailand, you can travel to Mae Hong Son as well. In Chiang Mai, everything will be most convenient. If you’re in Chiang Mai, you just have to wait for a bus, same as in Bangkok. In Chiang Mai, there will be 2 travel lines of the buses. The first line will take you along the Highway No.108 via Mae Sariang, or Highway No.1095 via Pai which shortens the distance to some 274 kilometers. Regular buses are operated by Prem Pracha Transport and Aya Service. The second line will take you along the Highway No.107 and 1095, which requires about 7-8 hours. Buses leave frequently from Chiang Mai to Mae Hong Son via Mae Sariang, Mae La Noi and Khun Yuam districts from 6.30-21.00 hours. Mae Hong Son Bus Terminal is located along Nawa Khotchasan Road, in Tambon Chong Kham, Amphoe Mueang, Mae Hong Son. Surrounded by beautiful green mountain ranges and clear blue skies, Mae Hong Son Bus Terminal is probably one of the most picturesque bus terminals in Thailand. There are only a few ticket counters in this bus terminal, all of which is located at the entrance. The most popular route here is the minivan from Mae Hong Son to Pai. Prempracha Transport is the only licensed operator servicing Pai. 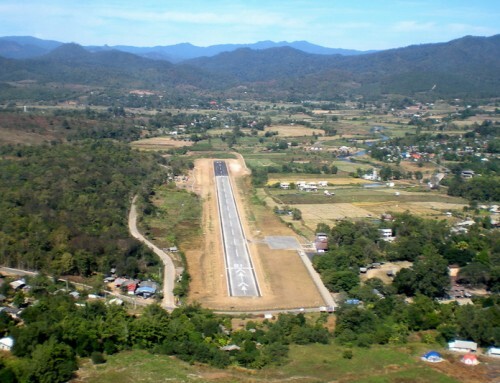 Passengers can also travel from Mae Hong Son to Chiang Mai. You will have to book a ticket before you get on a bus. In order to book a ticket, there are many ways. The most convenient way is to book one via a ticket-selling website via our links or Thai Ticket Major. You may find many vans that can get you from Bangkok to Mae Hong Son and Pai County, one of the most popular counties of the provinces. Just read the names of the destinations on the back of the van you want, or ask the driver. To reach Pai County and Muang County, getting a van will not be difficult. But if you want to get to some places that aren’t in the middle of community area, for example, an ethnic village, you may want to rent a car instead. There are many car-lending companies for you to contact and rent a car. This choice is good for every tourists who have driving licenses and want to travel conveniently, but don’t have a personal car. If you’re one of these, then rent one. Look for details from the internet. There are plenty of companies. You may choose to rent one in Bangkok and drive all the way to Mae Hong Son by yourself, or you can just travel to Mae Hong Son by a plane first then rent a car in the province later. Mae Hong Son to Pai district 111 kms. Mae Hong Son to Pang Mapa district 67 kms. Mae Hong Son to Khun Yuam district 65 kms. Mae Hong Son to Malanoi district 134 kms. Mae Hong Son to Ma Sariang district 164 kms. Mae Hong Son to Sob Moei district 192 kms. Chiang Mai to Pai 135 kms. Pai to Pang mapha 44 kms. Pang Mapha to Mae Hong Son 67 kms. Mae Hong Son to Khun Yuam 65 kms. Khun Yuam to Mae Lanoi 67 kms. Mae Lanoi to Mae Sariang 30 kms. Mae Sariang to Sob meoi 25 kms. Mae Sariang to Chiang Mai 191 kms.